As the summer starts to wind down (thank goodness), and it's time to start planning to squeeze in weekends away, exotic adventures, or even staycations for the holidays. No matter where you land, there’s a cheap and easy way to add a cozy vibe to your hotel room: Light a candle. Indie designer and minimalist candle maker Brooklyn Candle Studio has just the ticket. The 4 Gold travel candles make them easy to pack — and to set the mood. Just be sure to check with your final destination for the A-OK to use. The delicious-smelling soy candles are hand-poured into beautiful gold tins and boxed with shredded paper ready gifting with your chose of scents. Founded by Virginia native Tamara Mayne, she sought to create beautifully packaged natural candles at an affordable price point before moving to New York City. After working a series of jobs in finance and tech, her desire to work in a creative field led her to enroll in the Fashion Institute of Technology to study Graphic Design in 2009. Tamara was working as a designer and art director in 2012 when she decided to make candles as gifts for family with a candlemaking kit from her local craft store. 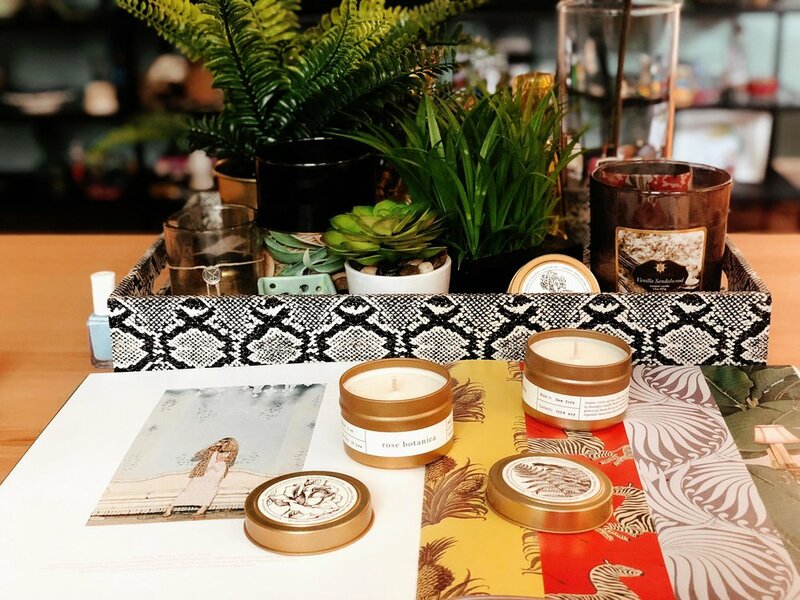 After became deeply obsessed with aromatherapy and the art of candlemaking, Brooklyn Candle Studio company took off from being sold at local market to getting picked up by stockist internationally and featured in Vogue and Glamour. Made in Brooklyn, New York with 100% soy-derived from All American-grown soybeans these delightful candles are eco-friendly and clean burn for up to 30 hours each. Using a lead-free cotton wick primed with vegetable-based wax and premium grade fragrance oil, with no added dyes or chemicals keeps your air free of chemicals and full of clean smelling scent. An important detail if you're prone to allergies like me. It’s pretty much impossible to walk into a room and not be enveloped by the warm, herbal fragrance note. The refreshing and woodsy scent create a calm atmosphere after a long day of exploring a bustling city. Bring that magic home with this 100 percent soy candles. A downtown take on your classic rose, soft floral notes strike a perfect balance with subtle notes of musk and sandalwood. I love the delicate perfume of this candle, and you can’t beat the price. If you’re a fan of floral fragrances, you’ll also love lightly romantic and intoxicating warm spring night in a tin. Even this allergic nose could bear the airy scent. A sultry masculine blend of earth and woods. Hinoki Cypress floats above a rich heart of cedar and pine. If you want to take that spring-clean mountain feeling to the next level, try this deep scent with notes over a warm base of vetiver and sandalwood. It's like being outdoors in the comforts of electricity and Netflix. Brooklyn candle studios collection of clean-burning soy wax candles offer up a whole slew of travel inspired scents, but our noses perked up as soon as we heard “woody” and “earthy.” The company’s gold travel collection evokes the scents of all your favorite places in the world and brings a humbling lived in feeling to your home or hotel.